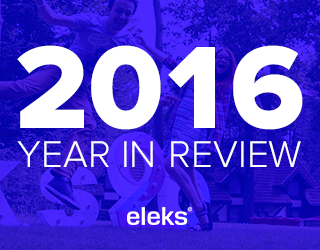 ELEKS closes out 2016, celebrating a major milestone of the company’s 25th year on the market with outstanding financial results, extended offerings and a focus on delivering advanced software solutions for enterprises. ELEKS has successfully wrapped up its 25th year on the global IT market, achieving exceptional financial results and extending its portfolio with several enterprise-level projects in the logistics and agriculture industries. While growing its presence in the U.S., U.K. and Europe, the company also entered a new and interesting market of the Middle East, adding to its customer base a business partner with representative offices in Jordan and Dubai. With R&D being at the core of ELEKS’ culture, the company is actively developing the R&D-as-a-Service offering, which already has a strong base and internal processes and practices in place to support it. ELEKS also keeps accelerating its key competencies, including Internet of Things, Data Science and Machine Learning, as well strengthening its retail expertise by creating the Retail Center of Excellence. The company’s extensive technology experience has been incorporated into the enterprise platform suite solution, allowing organizations to orchestrate and automate their various applications, data and processes. ELEKS’ dedication to innovation and engineering excellence has been honored with a number of industry awards and recognitions. The International Association of Outsourcing Professionals included ELEKS in its 2016 Top 100 Global Outsourcing Companies listing, Clutch named the company one of the Top Enterprise Software Development Firms, and two of the company’s projects have been shortlisted for the National Outsourcing Association Awards. ELEKS has been continuously investing in improving the quality and efficiency of its delivery organization and to scale it to handle the expected growth over the next 5 years. This effort has resulted in a 98% satisfaction rating that the company received according to the latest survey. In 2017, ELEKS will expand its portfolio of offerings with Technology Consulting and complete lifecycle Support & Maintenance services. For the third year in a row, ELEKS co-organized the Lviv IT Arena Conference, as one of its contributions to the community, to help promote product development culture in Ukraine; over 2,500 IT enthusiasts gathered from over a dozen countries for this three-day event. The company also actively creates new educational opportunities for talented technology students, launching training camps in software engineering, DevOps, QA, UX, Business Analysis and other topics, as well as organizing a software academy for post-combat veterans to help them start in IT, and also providing lecturers for local universities. said Ruslan Zakharchenko, ELEKS’ CEO. ELEKS is a trusted global organization that provides offshore, full-cycle, software product engineering services, from ideation to finished products. Since 1991, we’ve been helping businesses innovate and build advanced software products that matter, leveraging technologies such as Data Analytics, the Internet of Things, mobile applications and wearables. Our award-winning solutions have significantly contributed to the success of our customers, including Fortune 500® companies, and are recognized as a valuable part of international best practices. Our delivery organization, consisting of approximately 900 professionals in Eastern Europe, is strengthened by a local presence in the U.S., Europe and the UK.